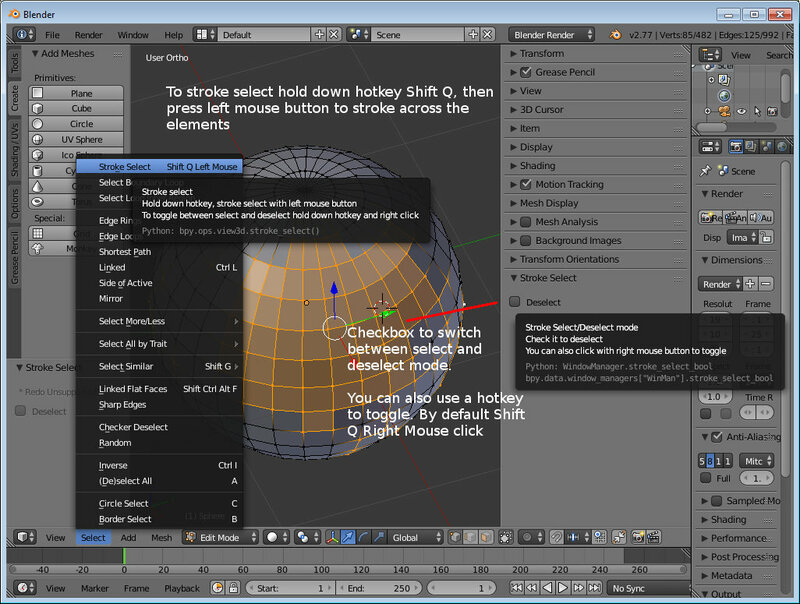 Stroke Select is a Blender addon to replace the Circle Select. You simply select elements by mouse stroke. And you can , different from the Circle select, still normally navigate meanwhile. The Circle select mode disables navigation. Click the Install from File button, and install the plugin. The script installs a menu item into the Select menu in the 3D space. The menu item in the Select menu is not functional, it’s just to show the hotkey and the tooltip. 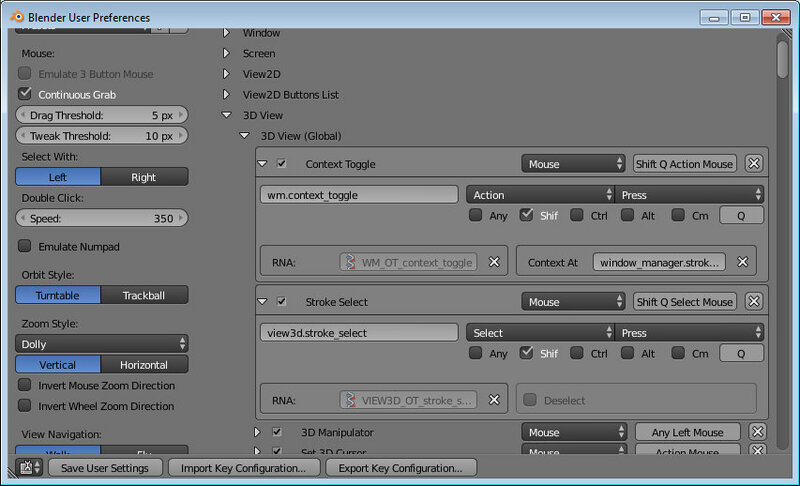 And a checkbox into the Properties sidebar of the 3D View. The checkbox in the Properties sidebar shows you if you are in Select mode. Which adds to the selection. Or in Deselect mode. Which subtracts from the selection. And you can switch here also directly. The script installs two hotkeys. One to select / deselect. One to switch between select and deselect mode. Hold down shift + Q. Then hold down SELECT* mouse button, and stroke across the elements that you want to select. The hotkey shift +Q plus clicking with the ACTION* mouse button switches between the select and deselect mode. *The Stroke select addon adopts to the current selection scheme. The factory defaults select method in Blender is Right mouse button select. So then the mouse button to select elements is RMB. When you use left click select, which you can adjust in the Blender user preferences, then the select mouse is left mouse button. And same counts for the Action mouse, just vice versa. To switch between select and deselect mode can also directly be done in the Properties sidebar. You can select elements in Object mode, Edit Mode, and for bones also in Pose mode. This means you can select objects, vertices, and also stuff like the handlers for a curve for example. You may want to change the hotkey. Blender is unfortunately full when it comes to hotkeys. And so i have chosen this combination. And who works with the Blender defaults may also want to switch the mouse buttons. The script selects with left mouse button by default. When you did changes at the keymap then don’t forget to save the User preferences. Or the changes are lost when you close Blender. And you have to refresh the text. It reads the values at activation. It does not recognize when the hotkeys changes. Turn the text display off and on, and the changes should be displayed. 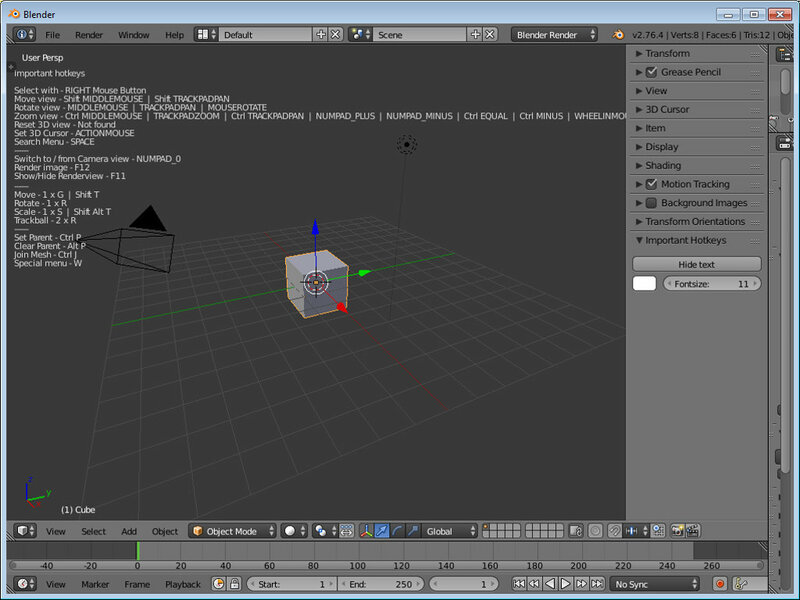 The addon is developed mostly with Blender 2.76. I nevertheless recommend Blender 2.77 as the minimum. The tooltip for the addon is already multiline. And Blender 2.76 cannot display multiline tooltips. Here the tooltip is one long string. The addon may or may not work with older Blender versions. I have tested it with Blender 2.75. And got some obscure error messages at installing. The addon then worked fine though. Fixed a problem with unregistering the menu entries. Changed the hotkeys from Left / Right mouse button to Action / Select mouse buttons. That way the hotkeys adjusts to the current navigation scheme. The factory defaults in Blender is rmb select. And you can as a user turn it to LMB select. This is the first release of the script. Everything is still in Beta. I just finished it. I haven’t found any flaws yet. Something where i am also still unsure is if i shall really select with left mouse button. The Blender defaults is right mouse selection. But honestly, who is crazy enough to work with the Blender factory defaults? I could of course start some experiments with action and select mouse. But for now it stays the way it is. There is the advice how to change the hotkeys above. Which should be good enough. The script is based at the commercial Paint Select script from Kjartan, and with friendly help from minikuof who has put the core method online at Github. Note that i normally grant the commercial Blender developers every income. But here i simply needed the functionality for my Blender Fork Bforartists. And the vital parts of the script can also be found in the Python API reference. What comes from me here is the whole rest. Installing the hotkeys and menu items. The hotkey functionality, and the toggle to switch between the select modes.